We got the first batch of comic books for our study group, so we'll get rolling soon. 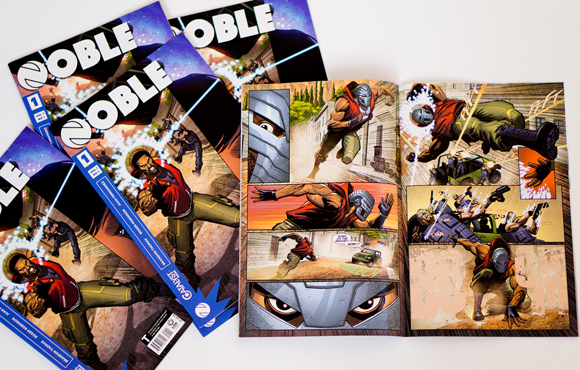 We'll start with Noble #1. It's an intriguing story that's wonderfully drawn, colored, and lettered. I hope the students will enjoy it as much as I have. My graduate student Rae'Jean and I will provide the students with observations and questions on Noble, prompting them to write about what they are reading and viewing. One of our objectives involves getting the students to recognize the collaborative work that goes into the production of comic books. Too often, just the narrative is privileged, and the artwork is mentioned in passing. But what about the interplay of story and art? And the combination of illustration and coloring? Oh, and what about the lettering?